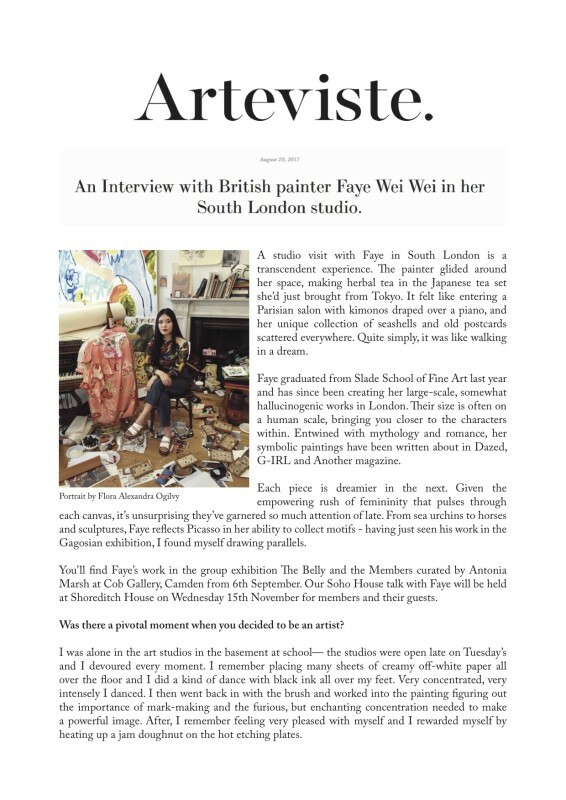 A studio visit with Faye in South London is a transcendent experience. The painter glided around her space, making herbal tea in the Japanese tea set she’d just brought from Tokyo. It felt like entering a Parisian salon with kimonos draped over a piano, and her unique collection of seashells and old postcards scattered everywhere. Quite simply, it was like walking in a dream. Faye graduated from Slade School of Fine Art last year and has since been creating her large-scale, somewhat hallucinogenic works in London. Their size is often on a human scale, bringing you closer to the characters within. Entwined with mythology and romance, her symbolic paintings have been written about in Dazed, G-IRL and Another magazine.